Mass spectrometry is fast becoming an indispensable field for medical professionals. The mass spectrometric analysis of metabolites and proteins promises to revolutionize medical research and clinical diagnostics. As this technology rapidly enters the medical field, practicing professionals and students need to prepare to take full advantage of its capabilities. 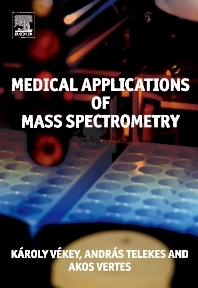 Medical Applications of Mass Spectrometry addresses the key issues in the medical applications of mass spectrometry at the level appropriate for the intended readership. It will go a long way to help the utilization of mass spectrometry in medicine. The book comprises five parts. A general overview is followed by a description of the basic sampling and separation methods in analytical chemistry. In the second part a solid foundation in mass spectrometry and modern techniques of data analysis is presented. The third part explains how mass spectrometry is used in exploring various classes of biomolecules, including proteins and lipids. In the fourth section mass spectrometry is introduced as a diagnostic tool in clinical treatment, infectious pathogen research, neonatal diagnostics, cancer, brain and allergy research, as well as in various fields of medicine: cardiology, pulmonology, neurology, psychiatric diseases, hemato-oncology, urologic diseases, gastrointestinal diseases, gynecology and pediatrics. The fifth part covers emerging applications in biomarker discovery and in mass spectrometric imaging. Provides a broad look at how the medical field is benefiting from advances in mass spectrometry. Guides the reader from basic principles and methods to cutting edge applications. There is NO comparable book on the market to fill this fast growing field. Medical professionals, practicing mass spectrometrists and students studying in these areas. Biomedical sampling, Gyorgy Vaset, et al. Analysis of complex lipidomes, Andreas Uphoff, et al. The human pituitary proteome: clinical applications, Dominic M. Desiderio et al. Mass spectrometry in clinical treatment, András Telekes et al. Professor of Chemistry, Professor of Biochemistry and Molecular Biology. Founder and Co-director, Institute for Proteomics Technology and Applications, The George Washington University. W.M. Keck Institute for Proteomics Technology & Applications, Washington DC, U.S.A.